Summary: It’s a crazy idea: trying to name the phrases that make love and connection possible. But that’s just what Kelly Corrigan has set out to do here. In her New York Times bestselling memoirs, Corrigan distilled our core relationships to their essences, showcasing a warm, easy storytelling style. Now, in Tell Me More, she’s back with a deeply personal, unfailingly honest, and often hilarious examination of the essential phrases that turn the wheel of life. 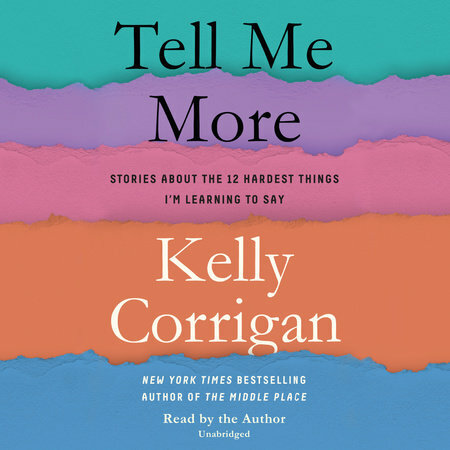 I decided to listen to TELL ME MORE: STORIES ABOUT THE 12 HARDEST THINGS I'M LEARNING TO SAY by Kelly Corrigan after Kathy's (aka Bermudaonion's) review of it. I have been running more lately and I like to listen to audiobooks while I exercise; however, I usually listen to thrillers. In fact, I rarely listen to (or read for that matter) books like this... but I am so glad I did. TELL ME MORE was exactly the right book for me at the right time. In this book, Ms. Corrigan chooses phrases that make a difference in her life... and it translates well into readers' lives too. Her book is oh so ever honest -- painfully so at times; and as a mother, wife, daughter, and friend, I could totally relate to her stories. I absolutely love that this book made me laugh and cry (and oh boy did I ever cry!) Honestly, I can't rave enough about this book. The book is divided into sections by certain phrases that are essential to Ms. Corrigan's life including "I Don't Know," "No", and "I Was Wrong." You might notice that the three phrases I mentioned are ones that aren't always easy to say, but so important to keep the important relationships in our lives running smoothly. For each phrase, Ms. Corrigan told stories from her personal life including hilarious ones about her mother, her daughters and husband, and even her childhood. However, the real beauty of this book was in the touching stories about her friend and her father in their final days. Ms. Corrigan lost her best friend and her father within a short time period, and as a reader, I could tell that these events rocked her world. I love that, after these losses, she decided to evaluate her own life. It makes me feel like there's hope even after horrible things happen. And because Ms. Corrigan is so insightful and witty, her words made me evaluate my own life. Can you really ask more from a book? 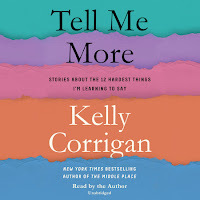 I read a past memoir about Ms. Corrigan's diagnosis of cancer with two little kids; however, I think TELL ME MORE just resonated with me more. I also think that listening to the audio version of the book made a huge difference for me. Ms. Corrigan narrated her story and she did an outstanding job. I think Kathy said it best when she said it felt like a friend sharing her story with her. I appreciated Ms. Corrigan's candor and emotion when it came to her observations on life, and I loved her sense of humor too. All of these things came through loud and clear through the audiobook version. TELL ME MORE is a wonderful memoir and just might go down as one of my favorite books of the year. Highly recommended! I downloaded this audiobook from Volumes. I'm so glad you loved this! It struck a chord with me too. I just started listening to it today. Loving it already!